The motor vessel Cilicia, sister to Circassia (III) and Caledonia V, was launched at Fairfield Shipbuilding & Engineering, Glasgow, in October 1937. 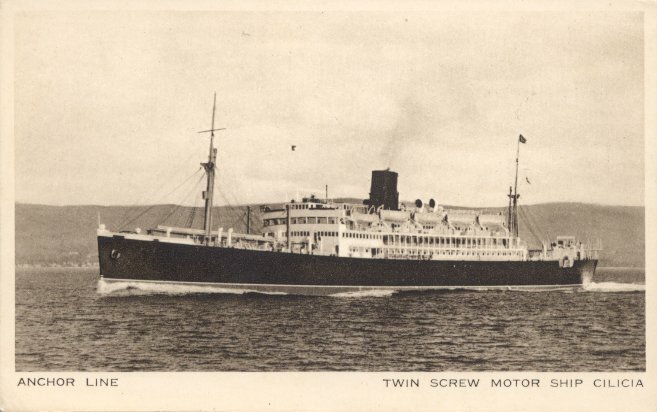 Her 1938 maiden voyage was from Glasgow to Bombay, the service Cilicia remained on for her entire commercial career. When World War II began, Cilicia was requisitioned for armed merchant cruiser service to the British Admiralty. While on that duty, and known as HMS Atlantic Isle, she assisted in the establishment of a weather station on Tristan da Cunha in 1943. The following March she was sent to Mobile, Alabama, where she was converted into a troop carrier. When she returned to service that December, she had accommodations for 2,400 troops. After the war, Cilicia was released to Anchor in 1946, was refitted for commercial service and returned to Anchor's India route in May 1947. She was sold by Anchor to Stichting Vakopleiding Havenbedrief of Rotterdam for use as a training ship; renamed Jan Bucks, she was based at Parkhaven, Netherlands. In 1980, she was sold for breaking up at Bilbao and was renamed Cilicia for her trip to the shipbreakers. Sources: Kludas' Great Passenger Ships of the World; Haws' Merchant Fleets.